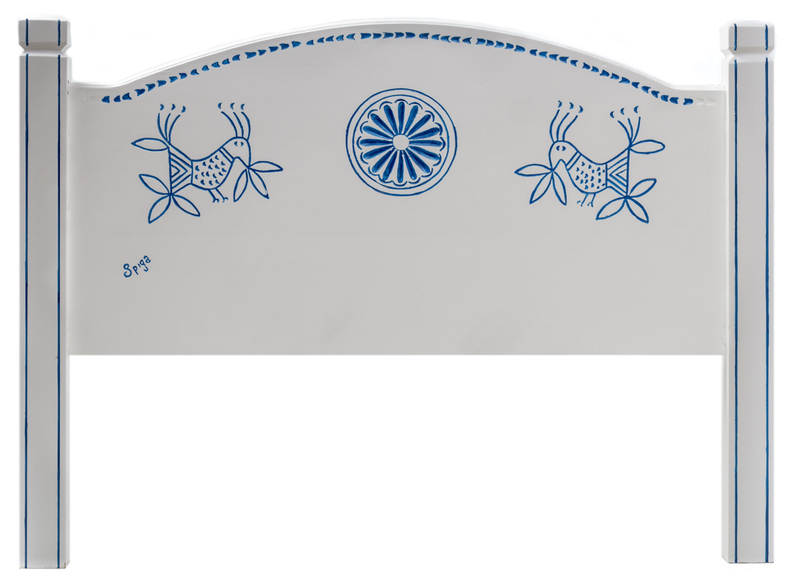 The headboard for the twin bed features an intaglio decoration with the rosette and lapwing traditional motifs, painted turquoise on a white background. 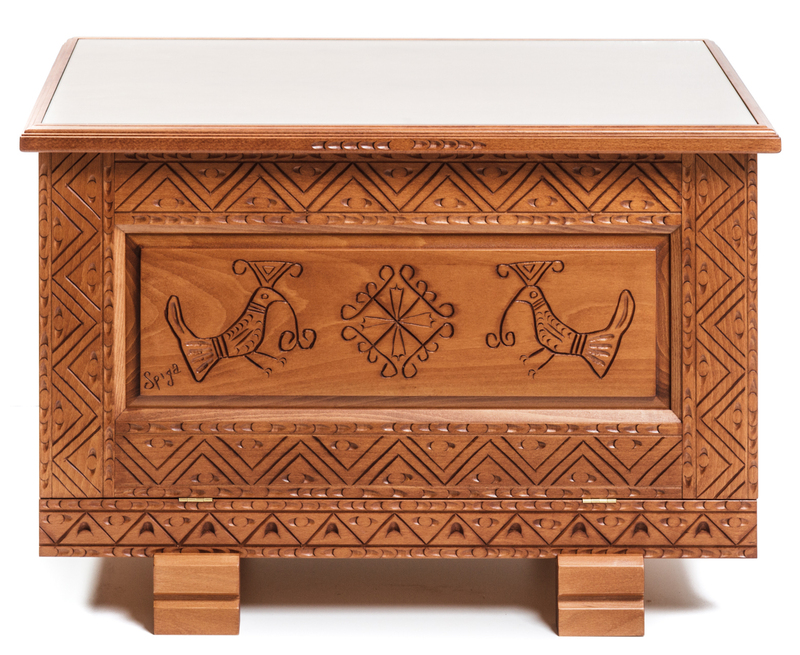 Hand-crafted using beech wood, it is available for double beds and matching other pieces of furniture for you rooms. 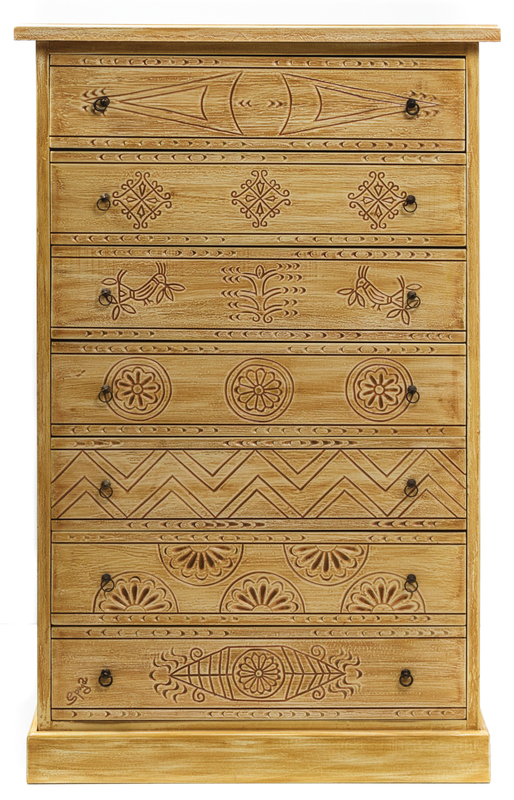 The storage unit equipped with a flap door, is richly decorated with incisions of antique motifs, carefully selected by the craftsman from a repertoire of traditional Sardinian wedding chests: half rosettes, stylised ears, antique lapwings. The bunch of grapes, executed following the relief technique, enhances and characterises the high-backed chair, the bottom of which is made of intertwined marsh grass. Bruno Spiga, a master furniture maker and carver, has managed the Arredointaglio joinery since 1985 in Villamassargia. His production is characterized by the skilful craftsmanship in making custom furniture, to which intaglio decorations are applied, being inspired by tradition and the study of compositional and modular canons, that the craftsman has learnt from the original artifacts. 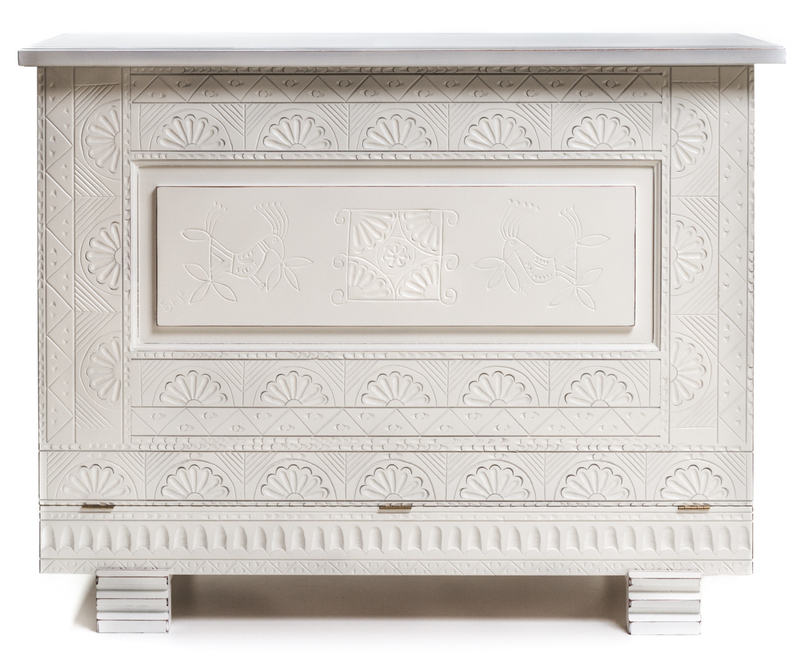 By participating in trade shows and industry events, Bruno Spiga keeps his work up to date by combining traditional decorative codes to new market demands, and collaborating with architects and designers. The experience gained with over two decades of work, carried out in Costa Smeralda villas and hotels, allowed the company to specialize in matching furnishings, tailored for commercial and accommodation facilities, always paying great attention to details and to the originality of the decorations, while paying tribute to tradition. The company is specializes in customized and personalized furniture, carried out in collaboration with the customer since the early design stages. Each product is characterized by high quality craftsmanship and precious intaglio decorations, made entirely by hand following traditional canons. Currently, they are experimenting new techniques, such as wood intertwining, used as a decorative detail. Each piece is handcrafted in all phases, including the selection of materials and their preparation, the cutting and interlocking, paying major attention to finishes. Intaglio is performed with a manual chisels. The painting is executed in a pressurized cabin that ensures maximum quality and durability over time.